Shark diving is a big industry in Cape Town. There are many shark diving companies which offer the best shark diving experience and guarantee safe and thrilling adventure. Here are some of the shark diving companies in Cape Town. Sharkbookings has been operating for 13 years now. Their mission is to offer you the best experience possible so you go away with life-long memories of their beautiful sharks. They pride themselves on their services and assures you the best experience. SharkQuests is an adventure diving operator based in Cape Town with a branch in the USA and has already established itself as a premier shark diving tour operator for Southern Africa. With their intimate knowledge of South Africa’s adventure environs, they deliver a spectacular African experience to each of their clients. SharkQuests offer unparallel adventure, a rich look at Africa’s unique history and culture, breath-taking scenery, and socially unique and entertaining atmosphere as you engage in their adventure tours, one-day trips and shark diving expeditions. They are also proud to present a collection of signature adventure-diving safaris built around the unique natural highlights of Southern Africa. Apex Shark Expeditions offers the opportunity to experience cage diving and predatory breaching with Great White Sharks, all in one trip. They ensure that every trip is an intimate and insightful experience giving you memories for life. They operate in False Bay, which is one of the most richly diverse oceanic habitats in the world and is made famous by the spectacular hunting behavior of its Great White Sharks. 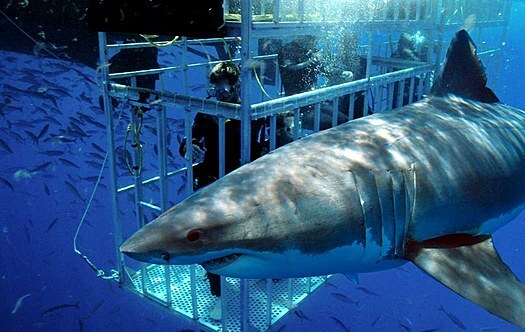 Shark Diving Unlimited is a fully licensed shark cage diving operator situated in the Great White Shark capital of Gansbaai. They pride themselves in their internationally recognized and exceptional success rate and customer satisfaction. This company is also the base of a well-known documenter and conservation advocate for sharks, Mike Rutzen, also known as the Shark Man for his amazing skill of swimming with these animals. Shark Diving Unlimited offers its client the amazing experience of white shark cage diving, white shark breaching trips, and PADI white shark speciality. Marine Dynamics is a Shark Cage Diving company based in Kleinbaai and is a multidimensional and multi-awarded Ecotourism and Conservation Enterprise. A trip with them is a guaranteed to be a combination of goose bumps thrills, education and relaxation on a luxury boat in the company of experienced experts and researchers. SharkDiving.co provides adventure tours and activities in and around Cape Town and primarily focuses on shark cage diving and surface viewing, shark breaching and scuba diving with sharks. They offer unparalleled customer service and ensures that all our clients are well looked after. Their shark tours include 1 day trip of blue & mako shark dive or 1 day trip of cow sharks & cape fur seals. Great White Shark Tours is owned and founded by a professional diver and skipper, Brian McFarlane. This company envisions to provide clients with an unforgettable education trip, diving and viewing great white sharks. They believe that every tourist who dives is entitled to have a great white shark swim past him or her an acceptable number of times. White Shark Ventures was established in 1991 became one of the first companies to offer shark viewing/diving tours in the channel at Dyer Island. They pride themselves in catering smaller exclusive groups which allow for more space and comfort on board. Their tours are highly educational and they actively participate in documenting valuable research information on great white sharks. African Shark Eco-Charters is owned and run by shark expert Rob Lawrence, together with his wife Karen and their dedicated team in Simon’s Town. This company is founded on the belief that true passion is when you take what you love and turn it into your work. They are a top shark diving company and they run the safest operation in False Bay. 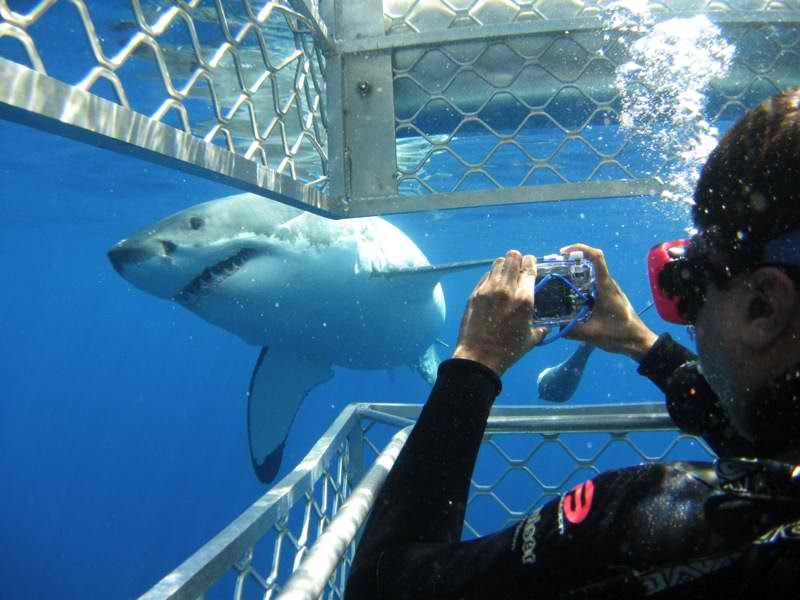 Their aim is for their clients to experience great white shark breaching or cage diving trip in a natural environment. They provide a natural encounter with the great white sharks allowing clients to observe social interactions and the natural predation behavior. Tours include shark cage diving, “airjaws” shark breaching trip, afternoon shark cage diving trip, five-day shark trip, 10-day great white shark tours, blue water predator trips and cow shark diving trip. These shark diving companies are guaranteed to provide very satisfactory client experience. If you will not be able to see sharks during your dive, another trip will be offered free of charge.